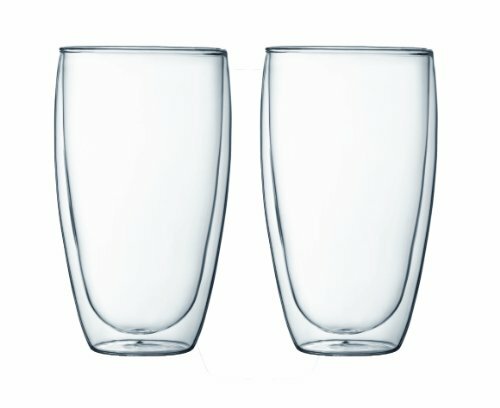 A complete line of insulated double-walled glasses by Bodum. Cool and unique -- that is Regi B -- and that is why I like cool and unique products for the home. 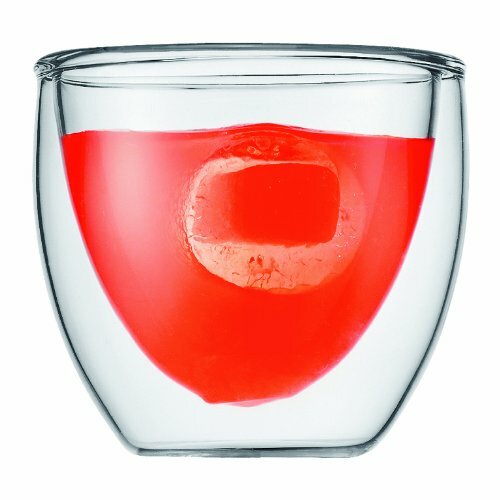 One such thing is Bodum's Pavina line of double-walled glasses. I like these glasses because they come in different sizes -- with different purposes. You might ask, "Different purposes?" Well, each size holds liquid beverages, so that is not so different. Still, each size is meant for its own specific type of beverage. Rest assured, you could "cross" sizes and types of beverage, but each glass has a type of beverage it was meant to contain and bring to your lips. 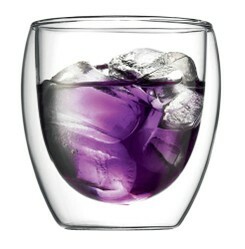 Let us drink in the Pavina double-walled glasses by Bodum. If you like an ice-cold drink -- I mean, really like it ice-cold -- you will like it longer in a glass that is designed to keep cold drinks cold. Such is the intent of the 21-ounce Pavina double-walled glass. What keeps the iced tea icy cold in this glass? Its double-walled construction insulates the beverage, which means the warmth from your hands cannot quickly change the temperature of the beverage inside. I like a nice craft beer. To me, it is one of the finer things in life. If you are going to put a nice head on your glass of beer, then you need room for more than just twelve ounces. 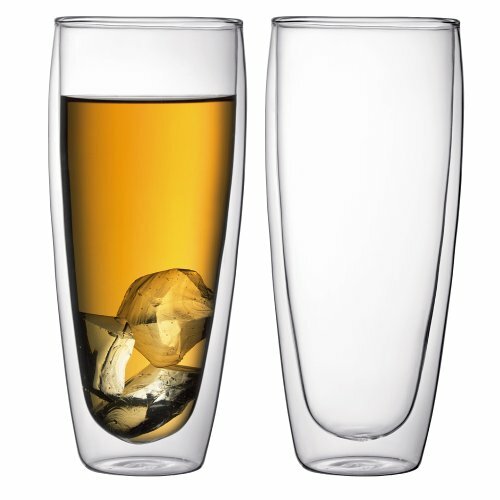 You will need another fine thing in life -- a double-walled beer glass by Bodum. The Pavina beer glass is dishwasher safe (unlike Regi B) and may be used to keep cold drinks cold and hot drinks hot (also unlike Regi B). 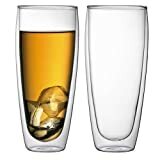 These great glasses have an average four-star review at Amazon, with over one-hundred reviews. That means a lot of people have bought these glasses and been more than satisfied. Here is a case where a glass's ability to keep cold drinks cold or hot drinks hot really comes in handy. In a 12-ounce tumbler, it is reasonable one might serve a cold drink, like soda, or a hot coffee drink with whipped cream. In either event, you want an insulated glass, as that will help you enjoy your drink longer. 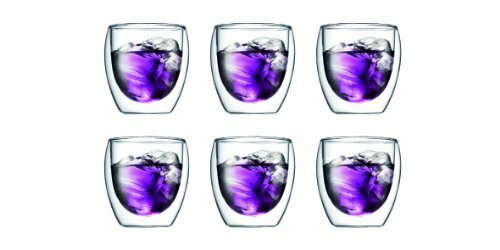 These Pavina glasses are double-walled, and therefore insulated, to keep cold stuff cold and hot stuff hot. What's more, people love them -- as indicated by the tons of positive reviews this product has garnered on Amazon. Me, I naturally keep my coolness cool, and my hotness hot. It's a gift. 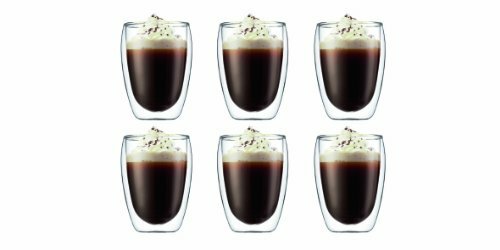 If you like cold juice or hot coffee, then an 8.5-ounce Pavina glass can perform either function for you with aplomb. People love the Pavina dual-wall glasses. This product has miles of positive Amazon reviews. One cool thing to remember about double-walled, insulated glasses is that you might have a piping hot serving of coffee inside one and not burn your hand when you pick up the glass. That is the beauty of the insulating factors of double-walling a glass. What is the beauty of being Regi B? I am still trying to figure it out. If you adore espresso, and you like to keep it nice and warm, then you need an espresso shot glass that can hold up to the elements. That glass is the espresso-sized double-walled Pavina glass by Bodum. Sure, you could use these glasses for shots of liquor too, but Regi B does not endorse that. I do endorse shots of juice, for silliness. Back to espresso. 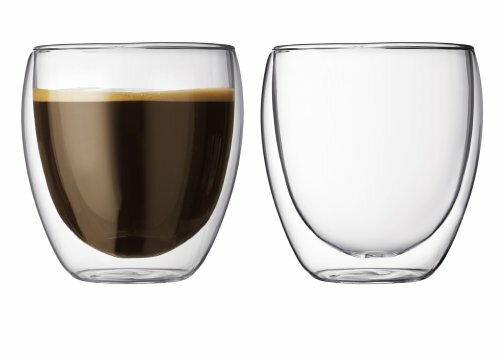 Imagine the expressions of joy guests will make when you serve them espresso in these beautiful, durable, dual-walled glasses from Bodum. If you have a thing of three to say about Bodum Pavinas, please leave a comment below.